Build your nursing skills through our accredited online RN to BSN program by pursuing a bachelor’s degree in nursing as an online student. If you are a licensed registered nurse, now is the time to complete your Bachelor of Science in Nursing. At the Woods, you will be empowered to pursue leadership positions in a variety of nursing careers. The 36 credit hour RN to BSN online degree is offered in an 8-week online format with the ability to extend two clinical courses to 16-weeks, if desired. A minimum of 30 hours are required to be completed at SMWC. Additionally, the student will need to have a total of 120 hours to graduate with the BSN degree. 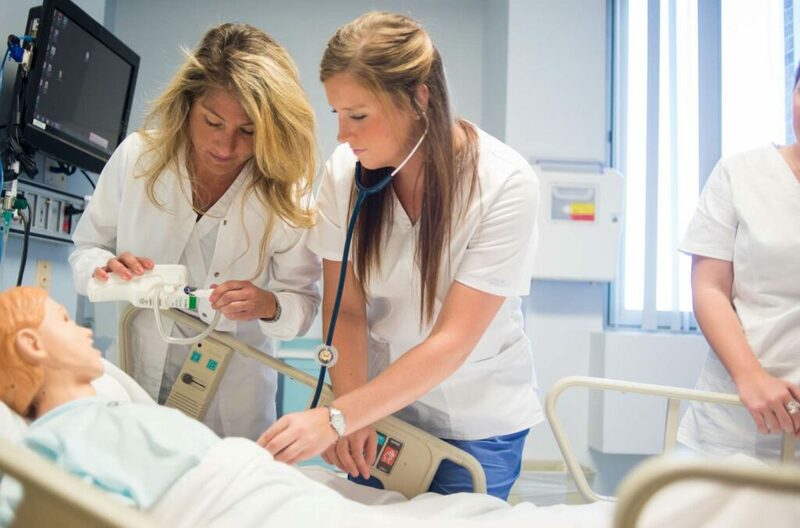 Unlike other online nursing programs and online RN to BSN programs, this program is based upon a cohort model which means that students are part of a group of RNs who will progress through the program together. 22 credit hours required; all courses listed. Students must complete each major course with a C or better and must maintain a 2.5 GPA through the program. Focuses on the expanded role of the professional nurse through the framework of the baccalaureate nursing program outcomes related to communication, health promotion, safety, culturally sensitive care and compassionate care, leadership, social justice, and professionalism. Fall and Spring. Prerequisites: Admitted into the RN-BSN track. Introduces healthcare students to basic concepts and techniques of data analysis used in healthcare practice. Focuses on techniques used when critically analyzing healthcare research literature. Includes the selection, application, and evaluation of statistical analysis techniques, including principles of measurement, data summarization, univariate and bivariate statistics, as well as basic qualitative analysis techniques. Emphasis is on application of findings for the improvement of patient care. Open only to online RN-BSN students. Summer. Emphasis is placed on developing an understanding of nursing theory, the logical process of research, on the scientific rigor necessary for carrying out studies of nursing interest, and on critically reading and using nursing research in nursing practice. Fall/Spring. Prerequisites: NU 220 and NU 222, or NU 305. Focuses on leadership and management theories with the application to nursing practice. Emphasis is placed on the importance of effective coordination of client care across various delivery systems. Prerequisites: NU 320, NU 343, or NU 305. Explores public health nursing using health promotion, risk reduction, and disease management and control strategies with vulnerable clients, families, and populations. Community assessment, epidemiologic, environmental, change, political action, and case-management frameworks are used to guide evidence-based nursing care in community settings. Forty-five (45) didactic course hours and ninety (90) practice hours. Prerequisites: NU 320, NU 343 or NU 305. Applies the role of the professional nurse, prepares the student for career advancement, and explores current and future trends in nursing and health care. Forty-five (45) didactic course hours and ninety (90) practice hours. Fall/Spring. Prerequisites: NU 430, and NU 485, or NU 305. 5 credit hours required; all courses listed. Explores the ethical issues related to biology and the practice of medicine. Provides an overview of crisis theory and interventions for working with clients in crisis. Crisis and conflict management theories, strategies and skills will be examined and applied to a variety of situations including those involving suicide, physical and sexual assault, natural and man-made disasters, grief or traumatic loss and violence in the workplace, the home, or the school. Pre-requisite: PS 111. These are the additional 9 hours required to meet SMWC Woods Core requirements. Only one 400 level WC course is required. WC 100 uses the concept of communities, and how they have influenced societies, education and the world to introduce the concept of the SMWC community and its particular values and ideas. Includes emphasis on critical thinking and writing, as well as information literacy. Serves as a foundation to help students identify their individual goals and values. Fulfills Woods Core requirement. Fall and Spring, every year. Examines social justice issues that have impacted present and recent social conditions world-wide. While the course will provide grounding for social justice topics in the associated areas in the social sciences, including sociology, business and economics; it will primarily focus on social justice movements in light of spirituality, specially how individual spirituality has impacted social justice movements. Spiritual roots of social movements in major faith traditions will be explored. In this context the course will also introduce students to some of the methods used by leaders of impactful social justice movements. Finally, the effect of advances in information and media technology on social movements will also be studied. It is one of three senior capstone courses available for the Woods Core. Prerequisites: WC 100, TH 200, and Junior or Senior standing or consent of the instructor. Introduce participants to the goals, principles, and practical applications of sustainability. Many organizations, companies, and institutions are increasingly interested in conducting their activities while becoming more sensitive to the environmental, social, and economic dimensions. In this course, we will examine the major environmental issues and trends happening in modern society from a scientific and practical perspective, including energy and resource use, pollution, climate change, water, and population. Five major themes in sustainability will be discussed: Sustainability and the link to the Sister of Providence, conservation, food sustainability, social justice, and financial sustainability. It is one of three senior capstone courses available for the Woods Core. Prerequisites: WC 100, TH 200, and Junior or Senior standing or consent of the instructor. An integrative view of women worldwide who have taken on leadership roles in their communities and initiated cultural changes. Students will examine transformative models of leadership that have addressed critical issues around the world. An introduction to international social norms and their influences on the struggles that women often face within their own countries and communities. A Vision of Change project is a required component of this course. It is one of three senior capstone courses available for the Woods Core. Prerequisites: WC 100, TH 200, and Junior or Senior standing or consent of the instructor. Download a sample plan of study. Utilize effective communication and collaboration skills through oral, written, and technology media with patients, nursing colleagues and interprofessional team members. Promote holistic health, including spiritual well-being, through the support of wellness and health related activities for self and patients. Guard patient safety through critical thinking, information technology, data analysis and risk management strategies. Provide effective, culturally sensitive and compassionate nursing care through the use of the nursing process that is supported by current, evidence-based research as indicated by educational preparation and scope of practice. Demonstrate effective leadership and management abilities through the competent coordination of patient care across the health care continuum. Advocate for social justice through the promotion of access, resources, quality health care, and prudent health policies. Exhibit professionalism through upholding the values, ethics and standards of nursing. Eligibility requirements include an associate’s degree with at least a 2.5 GPA, a current and active RN license, valid picture ID and successful background check. Is there a waiting list for the RN to BSN program? Where will I attend class and clinical? Classes for the RN to BSN program are completed entirely online with the exception of the two clinical courses. Through our online course management system, you will be able to access your course information 24 hours a day, giving you flexibility to work while completing your degree. Your capstone practicum can take place at your current employment setting. SMWC also partners with area health care organizations to provide a clinical setting for students.